Want to just have a quick play with asterisk? Try the Asterisk Live! CD which I've put together. Add a USB key or USB CF card reader and you can reload your configs automatically at boot..
NEW: CF card version What about a PXE boot version? Oh my! A hugely funny reference to start off… well ok perhaps not, but anyway a little background on me and reasons for writing the guide. I used to work for a Swiss bank here in Amsterdam, up until December 2002 that is, when I was made redundant. Having searched for a job everywhere and finding nothing – more accurately getting no interviews - I thought I’d get myself some new skills. Asterisk caught my eye as I’d been messing about with Free World Dialup, and had even splashed out on a couple of IP phones. As you probably know by now, finding some documentation was, well, a little difficult to say the least. The official guide, although it makes sense to me now, was just a collection of gibberish. In the end I decided to do something about it, not only to stop me going insane but to try and help others on those ‘first steps’ to setting up and running what must be the Linux PBX software. Asterisk is a complete PBX in software. It runs on Linux and provides all of the features you would expect from a PBX and more. Asterisk does voice over IP in three protocols, and can interoperate with almost all standards-based telephony equipment using comparatively inexpensive hardware. Asterisk provides Voicemail services with Directory, Call Conferencing, Interactive Voice Response, Call Queuing. It has support for three-way calling, caller ID services, ADSI, SIP and H.323 (as both client and gateway). Check the Features section for a more complete list. Asterisk needs no additional hardware for Voice over IP. For interconnection with digital and analog telephony equipment, Asterisk supports a number of hardware devices, most notably all of the hardware manufactured by Asterisk's sponsors, Digium. Digium has single and quad span T1 and E1 interfaces for interconnection to PRI lines and channel banks. In addition, an analog FXO card is available, and more analog interfaces are in the works. Also supported are the Internet Line Jack and Internet Phone Jack products from Quicknet. Asterisk supports a wide range of TDM protocols for the handling and transmission of voice over traditional telephony interfaces. Asterisk supports US and European standard signaling types used in standard business phone systems, allowing it to bridge between next generation voice-data integrated networks and existing infrastructure. Asterisk not only supports traditional phone equipment, it enhances them with additional capabilities. Using the IAX Voice over IP protocol, Asterisk merges voice and data traffic seamlessly across disparate networks. While using Packet Voice, it is possible to send data such as URL information and images in-line with voice traffic, allowing advanced integration of information. Asterisk provides a central switching core, with four APIs for modular loading of telephony applications, hardware interfaces, file format handling, and codecs. It allows for transparent switching between all supported interfaces, allowing it to tie together a diverse mixture of telephony systems into a single switching network. Asterisk is primarily developed on GNU/Linux for x/86. It is known to compile and run on GNU/Linux for PPC. Other platforms and standards based UNIX-like operating systems should be reasonably easy to port for anyone with the time and requisite skill to do so. Asterisk is available in the testing and unstable debian archives, maintained thanks to Mark Purcell. Asterisk was originally written by Mark Spencer of Digium dba Linux Support Services, Inc. Code has been contributed from Open Source coders around the world, and testing and bug-patches from the community have provided invaluable aid to the development of this software. Just to clear up any confusion that may occur here are the conventions used in this guide. Text that appears in grey boxes like this contain the text that should be typed in, or output depending on the context; however you should omit the leading # character as this simply represents the shell prompt. In order to use Asterisk you are going to have to use Linux. If you are a Linux ‘guru’ then you might want to skip this section and just take a look at the dependencies. 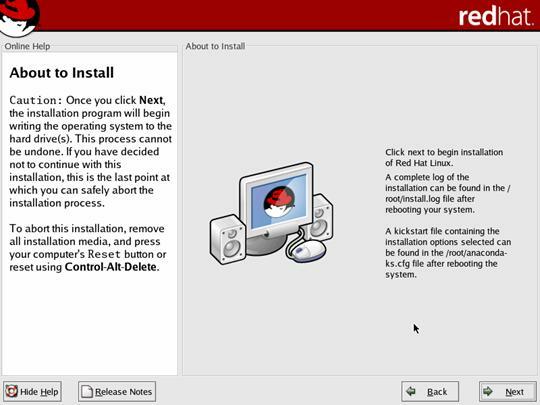 This section deals with installing a Linux system for use with Asterisk. 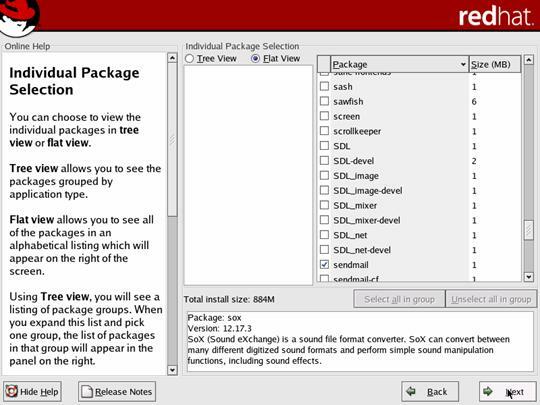 I make no excuses or arguments for the chosen distribution, Red Hat 8; I have no intention of discussing the pros and cons of the many different distributions available. 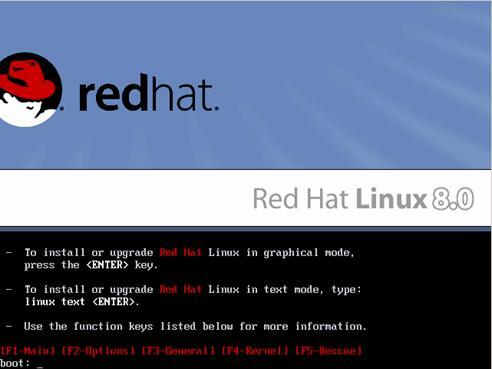 In other words, if you don’t like Red Hat, stop bitching and find a windows user to torment. 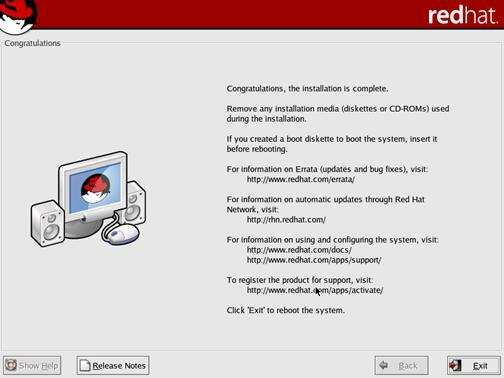 I’m not going to tell you how to create the CD’s required to install Linux, there are other sites for this. You can find the ISO images required from places like http://www.linuxiso.org. Download the ISO images and burn them. For This installation you only actually need disks 1, 2 and 3 (the assumption is you are using the default language settings)– If you are pushed for a network connection you can get away with only downloading and burning those, however, I would recommend getting the whole set for the sake of completeness. The first step is to insert CD 1 of your freshly burned ISO images into the target machine’s CDROM drive and boot. At this stage I’m going to make an assumption that you are either installing Asterisk on a new machine or overwriting the disks of whatever was there before. If you want to dual boot into Asterisk, please look elsewhere for initial configurations. You might want to consult your physician too. I make no apologies that this section is going to treat you like a moron; this is intentional. 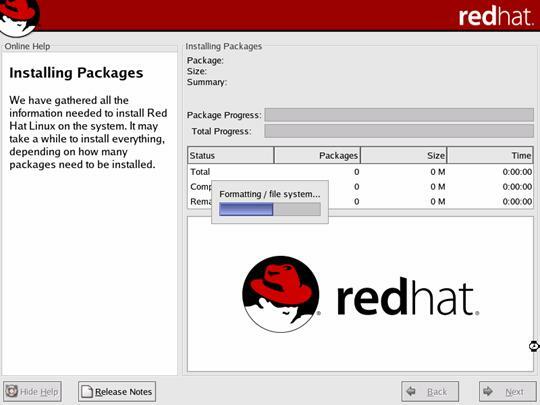 Since we want to be sure that you have no problems running Asterisk we need to make sure that your installation matches the one I used to build and run it. The first thing you will need to do on your target machine is ensure that you can boot directly from CD. Most modern (if not all) will allow this, it is usually just a setting in your BIOS. If you don’t feel comfortable with messing in the BIOS the simplest test you can do to check and see if booting from CD is enabled is, funnily enough, to put CD 1 into the drive and reboot the machine. If the machine starts to boot and eventually shows a screen like the one on the following page, then you are ok. If you are happy fiddling with the BIOS then just enable booting from CD and make it the first device to attempt to boot from. 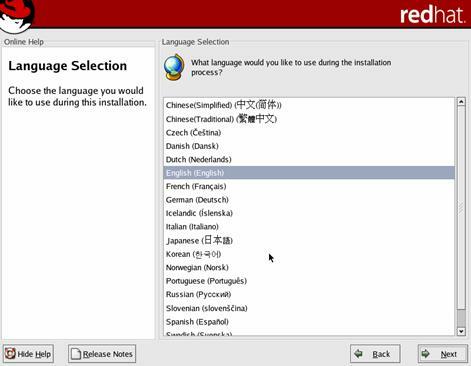 Select the language you want to use during the installation. Since I used the default on English, all the following screens will also be in English. Then Click NEXT. 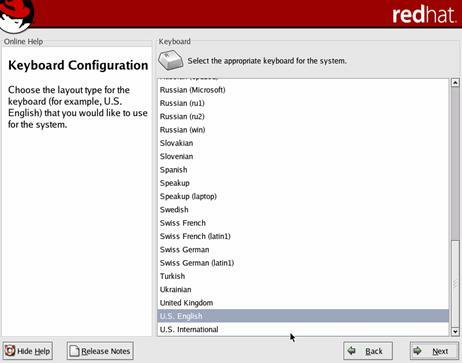 Select the keyboard layout for your particular PC. Most keyboards in the English speaking world tend to be U.S. English but check yours. Since we are not going to be installing a windowing system on this machine, in all honesty we don’t care about the mouse. Click NEXT. 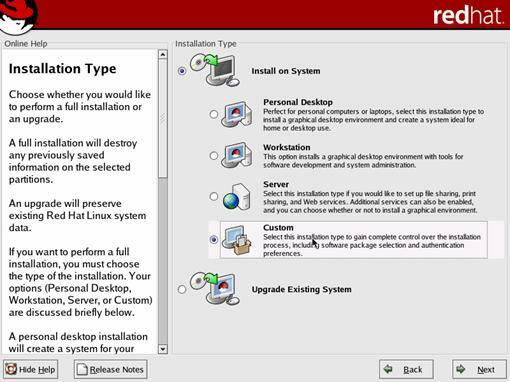 Since we are going to build a custom installation select CUSTOM and click NEXT. This bit might seem a little scary, there’s nothing to worry about, since we have already established that we are NOT going to dual boot and there is nothing that we want to keep on the disks in this machine. You did check that right?! Click NEXT. If you get the previous screen, don’t worry too much just click YES. You many note that the message box refers to ‘hda’ not ‘sda’, don’t worry about this either, it’s just the type of disks you are using. If you have IDE disks then this would say ‘hda’. 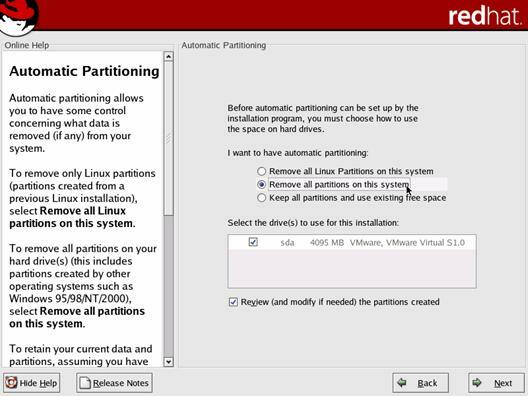 If the disks have been previously used for another Operating system then select the ‘Remove all partitions on this system’ option. If your disks are brand new and have not been used before then either of the first two options is fine. The box below these options will list the hard drives available on your system, leave the selections alone. 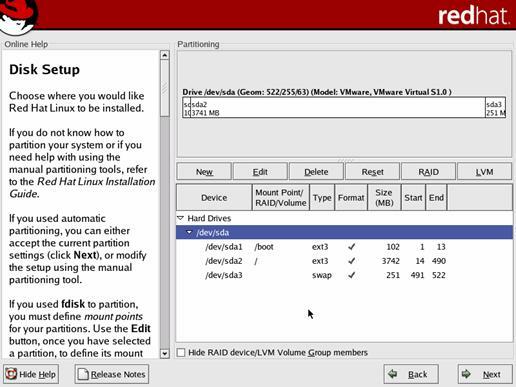 You should see the following screen showing how the disks will be laid out, click the NEXT button. Now comes the hard part. If you know nothing about your network then we are going to be a little stuck. This is the part that is specific to your installation. I am not going to attempt to explain how networks function, if you have one they you should at least understand the terms in the next couple of paragraphs. 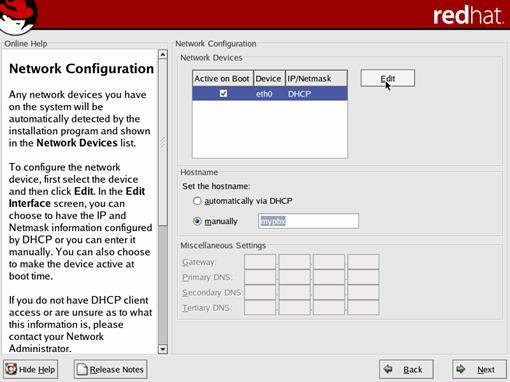 As shown on the screenshot on the previous page, the default for a Red Hat installation is to use DHCP. 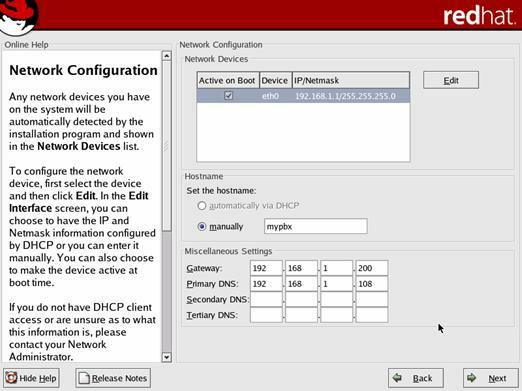 If you are using a DHCP server on your network then you can click NEXT. If you are not then you will need to click the ‘edit’ button, then deselect DHCP and enter an IP address and subnet mask for this machine. As a side note most home run networks tend to use the address range 192.168.0.x and a subnet mask of 255.255.255.0 – The x being replaced with the individual IP address of a particular machine. 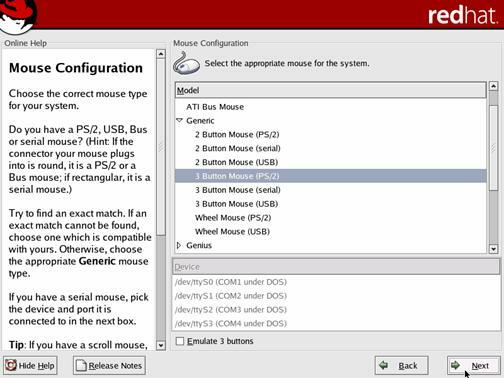 You can establish this by looking at one of your other machine’s, and its configuration settings. Again, generally, the Gateway and DNS are usually going to be something like 192.168.0.1 for both. This is however VERY SPECIFIC to your network. You much make the setting match your existing network. If you are using DHCP then for the hostname you can let DHCP handle it. If not then select ‘manually’ and type a name for this host. 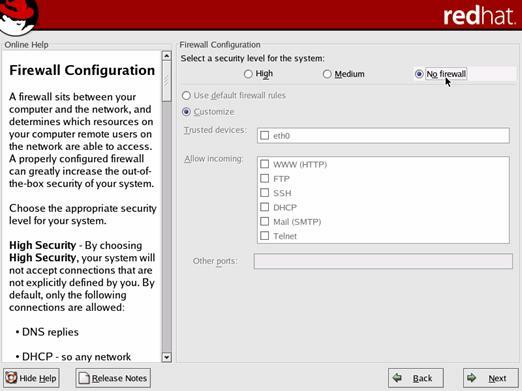 Select ‘no firewall’ and click NEXT. Click NEXT. 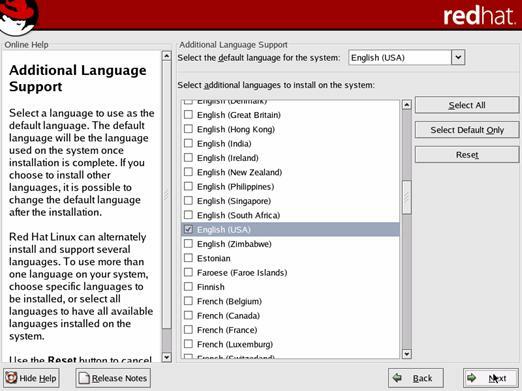 If you want to use additional languages, select the ones you want first. 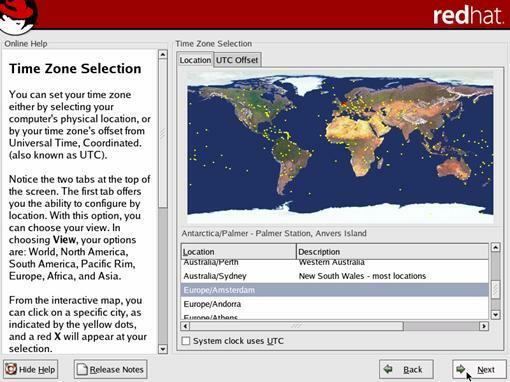 Select your location or at least the nearest place to you that is listed and click NEXT. 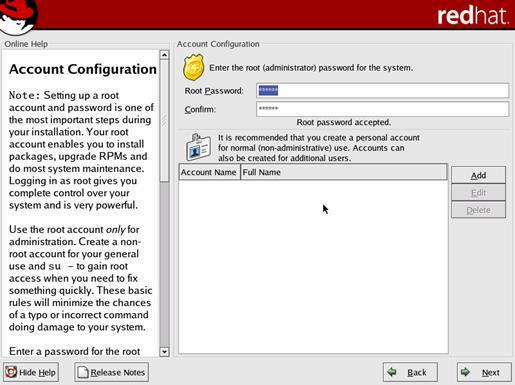 Enter a password for the ‘root’ user. 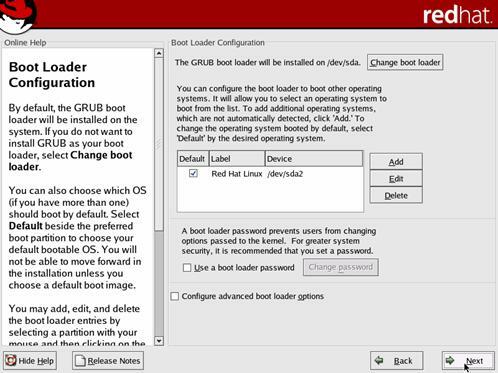 If you were unaware, the root user is like the administrator account on a Windows machine, the big boss account.. Use TAB or the mouse to move between the fields. Once you’ve done that (and remembered the password!) click NEXT. 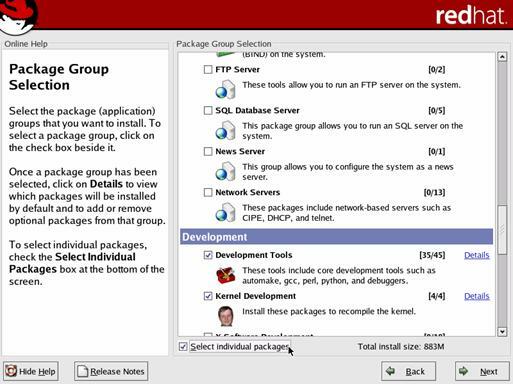 Make sure you also have ‘Select individual packages’ selected (see cursor on previous page screenshot). 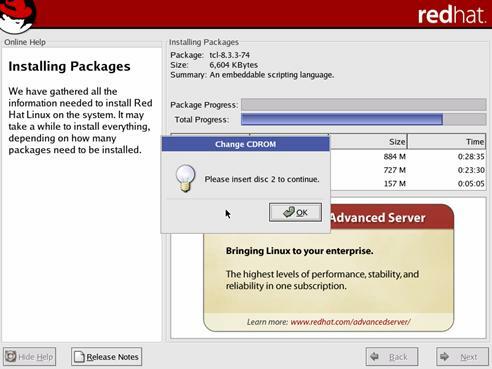 The first ting you’ll see is the disks being formatted and partitioned, once complete the various packages will be installed. 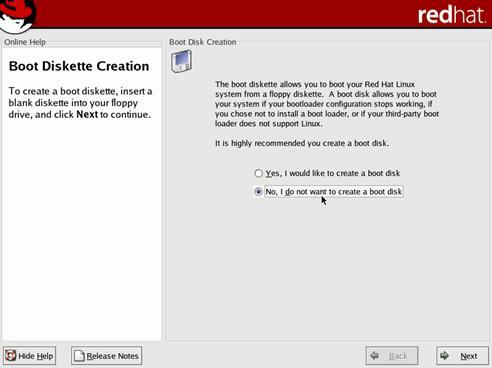 You will be prompted to insert disks, change the CD, and then click OK.
You don’t really need to create a boot disk. Select no and click NEXT. Get a coffee, tea, cola or drink of your choice and bask in this glorious moment. Then read the next section on installing Asterisk. 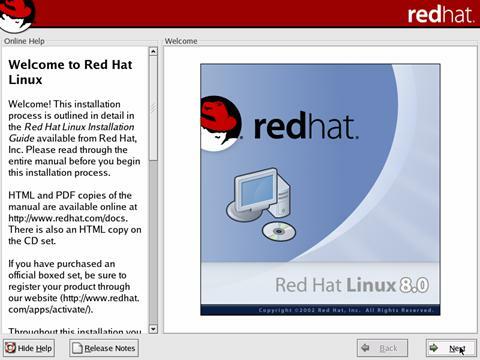 Note that the copy of mpg123 that comes with Red Hat 8 is of no use to you, it will not work with Asterisk. You can run Asterisk without any of Digium's hardware but unless you have some sort of PSTN gateway/card you’ll only be making network calls. The best way to obtain Asterisk is to check out a fresh copy from the CVS Server. # cvs login            - the password is anoncvs. This will create four directories, zaptel, libpri, and asterisk. Compiling them is generally quite straightforward. Just change to each directory and type make install, in this order. Compile zaptel, then libpri, and then asterisk. And hit enter in the Asterisk command line, Asterisk will exit. Digium sell a number of cards for use with Asterisk, these range from single FXO in the guise of the X100P through to fully fledged quad E/T1 cards. If you are setting up Asterisk at home then an X100P (or two if you have 2 lines) should be enough for your needs. You might also want to get an FXS card so that you can get standard analog phones working with Asterisk. TDMx0B where x is either 1, 2, 3 or 4 – denoting the number of ports. There are a couple of things to note about the X100P. Although the card should work in your country things like caller id detection may not. In the USA you should have no problems at all, but in Europe/rest of the world you should consider searching the archives for information. UK Not on BT, *SOME* cable companies may work. If anyone has any other locations that are known to work/not work please let me know. If you are not going to be adding cards to your system you may want to skip this section to get started, although it is recommended that you read the entire document for completeness. In the machine I use for Asterisk; a Dell Optiplex GX115 I have disabled the soundcard since I do not need it. You may wish to keep it enabled but bear this in mind if you get IRQ conflicts. I hope I can make the assumption that you are capable of adding a new card to your system, if not get someone who knows what they are doing to help out. Oh and please wear a wrist strap. The X100P card is what we call an FXO (Foreign Exchange Office) card. Unless you know about telecoms then that probably didn’t mean much. What it means to you and me is that you can plug a cable into the phone socket on your wall and into the back of the X100P; this is your incoming line from your telecoms provider (KPN/BT/Bell etc). You may have noticed that there are 2 sockets on the back of the X100P; one marked as the line interface and the other as a phone interface. Plug in an appropriate cable between the wall socket and the line interface on the card. If you have a spare phone then plug this into the phone interface on the card too. It is always good to have a phone plugged into this interface because in the event of asterisk failing, or a power cut the card actually still allows access to the PSTN line. Obviously if you decide to use a phone that is not powered from the phone line, if you have a power cut, it will not work. The TDM400P card is an FXS (Foreign Exchange Station) card; it’s what you plug standard analog phones into to use them with asterisk. For those using phones from the UK you may need an adaptor that provides a ring capacitor to actually get the phone to physically ring. I have both a BT Easicom 1000 and a Panasonic KXTCD-777 (this is a DECT base station and 2 handsets sold in one box). The Panasonic phones do not require the adaptor with ring capacitor but the BT Easicom does. If you are using phones from the USA (aside from any power requirements they may have) you should just be able to plug them in. Once the cards have been physically plugged into your Asterisk machine, power it up again. Once you’ve logged in you’ll need to configure the cards. It’s worth pointing out that you do not have to have one of each card type but this section will make the assumption that you have got one of each so that we can cover a much fuller configuration. The loadzone and defaultzone are fairly obvious and are simply your ISO country code – Not all country codes are available, but to be honest I was running with ‘us’ for a couple of months here in Holland with no issues.. The first 3 lines are very important so pay attention. Just to confuse you more FXO ports use FXS signaling and FXS ports use FXO signaling. So from the above configuration you can see that port 1 (fxsks=1) is actually an FXO card (X100P) and ports 2 and 3 are on the FXS card (TDM20B). Note that you do not have to have the cards in this order, but they must match the order you modprobed them. Since I have a single port FXO card and a 2 port FXS (with the ability to add 2 more ports) it makes sense to put the FXO card as the first, otherwise I’d have to change my configuration files a bit when (if) I added more FXS ports. At the bottom of this section are example zaptel and zapata config files that should work immediately if your configuration MATCHES mine – i.e. you have 1 X100P and 1 TDM20B. The gain options allow us to increase or decrease the ‘volume’ if the devices we have appear to quite or loud – to be honest you should not really need to change the rx/tx gain settings under normal circumstances. There is a good reason for this, if for example, you had 10 outgoing lines, you would normally want to dial out on any line that was available, not a specific one. Using the group option will allow asterisk to search for a free line within that group. Pickup groups allow you to group devices, phones or lines together so that you can pick them up using *8. For example if a phone connected to FXS port 1 rings you may want the phone on FXS port 2 to be able to pick it up. The immediate feature is what I like to call theBatphone option. If this is set to yes, when you pick up the line it will automatically dial the ‘s’ extension for the context this line is in. Think back to the TV show Batman, when Commissioner Gordon was in his office and needed to talk to Batman, he simply picked up the receiver on the red Batphone and it rang in the Batcave. So you see, even super heroes can use asterisk! In this instance it’s of no real use to us, as we are defining the PSTN line..
It’s worth noting that all the values (above the channel=1) now become the default values for all other channels, this means you only need to change those you want and all others will be taken from above. mailbox=2468                   ; you will need to create this mailbox! mailbox=3579                   ; you will need to create this mailbox! If you've ever looked at a windows .ini file you'll notice the format is very similar. In the [general] section you need to add a line to register asterisk with your sip proxy (eg ix66), you should end up with something like the example below. An important point here, if you do not have a sip aware firewall and are just using port forwarding then ensure that your context points to somewhere like ‘invalidcalls’. If you do not do this then someone could call one of your extensions direct from the Internet. If you had an FXO card in the machine, this could lead to them being able to make PSTN calls!! A couple of things to note here, obviously the sip address "me@mysipproxy.com" is one that someone would normally call you on. The /1000 at the end of the 'register =>' line is actually the extension that asterisk will use for this address, ie when someone calls me@mysipproxy.com extension 1000 will ring. If you re registering with FreeworldDialup then you will need to add your password to the register line too: e.g. type = - this is a peer. host= - the ip address of the ASTERISK server. fromdomain - the domain that the username is from. We now need to define a couple of phones. I use Snom 100's, but you may just want to use sjphone (http://www.sjlabs.com) or something like that. Since the configuration for both phones will be similar I'll only deal with 'phone1'. First of all the [phone1] is important, it's what you will use in your extensions file to identify this physical phone when issuing Dial commands. (e.g. Dial(SIP/phone1,20,tr) - we'll get to this later). The type= is going to be a friend in this instance, peer is used when Asterisk is contacting a proxy, user is used for phones that can only make calls, and friend acts as both a peer and a user. Set your host=dynamic and the IP address in the defaultip= entry too. If your host has an entry in your DNS then you just enter the machines name in the host= field. Unless you have a good reason to leaving it as dynamic and using the IP given to the phone (fixed or DHCP allocated) is perfectly ok. The username and secret fields are only used when the username is not the same as the client. You should be able to safely ignore this for the moment. dtmfmode= is somewhat trial and error, it depends on your physical phone or software, I've found that my Snom 100's need rfc2833 for DTMF tones to be heard, and SJphone needs inband. Essentially it's trial and error, but once you establish which is needed for what type of phone, it applies to all. 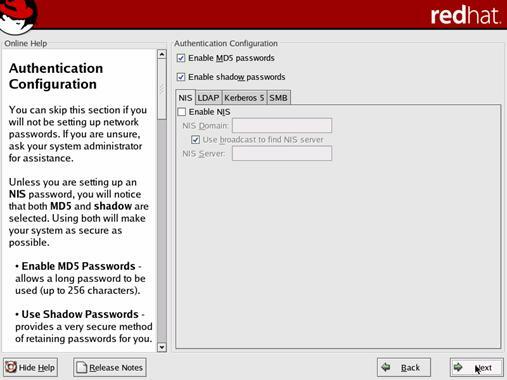 This should not be installation specific, ie I've just told you that Snom 100's use rfc2833, so you can use those too..(for the Snoms also change the phone config. mailbox= is the voicemail mailbox that is checked for messages, this information is then passed to the phone, on a Snom 100 phone it results in an envelope icon. Usually you'll have more than one mailbox, one for each user or extension. callerid= is pretty self explanatory, however, note that the callerid must be in the format above, ie "text" <number> it's the whole line that's the callerid, not just the bit in quotes. Essentially the name goes in the quotes and the number between the < and >. You'll see there is a lot of information here, for the moment ignore this. Go to the bottom of the file and add [sip] and press return. This needs to be the same as the context= section for your phones defined in sip.conf surrounded by square brackets. If I had set the context= to wibble (context=wibble) then this section would be called [wibble]. Since an extension may have a number of commands there may be multiple entries for an exten. We'll do some more complex stuff later but for the moment save this file. ERROR: File asterisk.c, Line 1249 (main): Asterisk already running on /var/run/asterisk.ctl. Use 'asterisk -r' to connect. and hit enter at the prompt. If you did not get the error you do not need to do anything, however you might want to attach to the daemon anyway using. Ok, so you've got the basics going, and it's great - if you happen to sit by you phone all the time. What happens if you are out/away from your desk/sleeping you'll miss those vital calls. We need to set up voicemail to capture all those messages if we miss them. The section we are interested in is [default]. If, which is likely, you have the sample configs installed then you will see a number of entries in this file. You can comment them out if you like by placing a semi-colon ';' in front of the line. Once you have added the line for the 9999 mailbox, save the file. Next we'll need to edit out sip.conf to make sure that the phones we set up earlier are going to use the correct mailbox for notification. Note that this will be of most use if your phones support either a message waiting indicator of some sort. When extension 1000 rings (exten =>1000) , the first thing we do (exten =>1000,1) is dial phone1 and phone 2 (exten =>1000,1,Dial(SIP/phone1&SIP/phone2,20,tr)) and make it ring for 20 seconds. There are 2 things to note here, the first is that the priority number has jumped way up to 102. This is a feature of Asterisk, and a useful one at that. When the call comes in and Asterisk tries to dial the extension 1000, if you are on the phone, Asterisk will jump to the current priority + 101 (n + 101). This gives us a priority of 102. The second thing to note is that the mailbox number at the end of the line is preceded by a b (b9999) this indicates that the busy message should be played to the user, and then the user should be allowed to leave a message. This is all very well, people can leave you messages, but at the moment you can't listed to them! Not really useful is it. We need to set up an extension so that you can actually get to the messages. there are 2 ways to set this up. The first is useful in home environments where you are only really going to have one mailbox or where you trust people completely: I say this because the first way to do it is to effectively not use the password. (I'll show you the other was in a moment). Under the exten => entries you've just added add the following lines. Note the user doesn't get asked for a password. Save your extensions.conf file ... Sorry but we've been doing quite a bit here and I want to make sure you remember to save the file. "The person at extension 1000 is not available..."
After the beep, leave yourself a message and then hang-up. Then dial extension 1001 and listen to your own message, make sure it all works.. Remember, when we first started, we set up a registration with FWD and allocated extension 1000 to it? Well, you've now added voicemail to your FWD number! You're probably getting quite caught up in Asterisk by now, so take a look at the documentation, see if the sections we've covered make more sense to you now...Well, that's all for now, next time we'll look at Call parking, and meetme extensions. Call parking is a wonderful invention, the best way to explain how useful it can be is to use a real world example. Imagine the scene, you're on your own in the office. Your desk is on the 2nd floor and the computer room is on the 4th. You are working late to fix a problem on one of the servers, but you need some help. You call another support team - they say they are busy but will call you back in 5 minutes. When they call you back they ask you to fiddle with the server. 1. Say "hang on", run up stairs and do what they ask then run back and say "done that" only to hear them ask you to do something else. 2. Say "hang on, I'll transfer the call upstairs", you transfer the call to the computer room, run up stairs, pick up the phone in the computer room, run downstairs hang up, run upstairs and talk to the support team. 3. Say "hang on, I'll transfer the call upstairs", you park the call, hang up, run upstairs to the computer room and pick up the parked call. Now, it's clear that option 3 is the best for us. Parking the call, basically involves transferring the call to a 'fictional' extension that will hold the call until we either pick it up, the caller hangs up, or the timeout period expires. It should be self explanatory, but we'll go through it just to be sure you understand. parking.conf file has this number set at 700. I've changed mine to 701 because I was having an issue with Asterisk - although it would 'see' (looking at the console) I had tried to transfer to 700 it appeared not to believe that I had dialed it. This was essentially due to the 00 in the 700, changing it to 701 eliminates the problem completely. parkpos=> is the range of numbers used to park calls in the extract above I get 19 parking extensions, enough for me but you might like to expand it if you have more users. context=> is the context that you need to include to allow types of call to use call parking, this prevents external users parking YOU on your own system! parkingtime => is the length of time in seconds to park the call. Once this time expires the original extension will be called again. The 'T' allows the calling user to transfer the call as well. Be careful. you don't want an external user to be able to transfer your call around the system. Note: This is only 'SAFE' here because the 2 extensions we set up are not accessible from the outside world. In our current setup, all calls are sent to extension 1000 - just because it's physically the same device doesn't mean anything. So, do NOT add a 'T' to your 1000 extension line unless you REALLY REALLY want someone from the outside to transfer you on your system. I can't stress this enough, you don't want external callers messing with your setup. Now dial from extension 'phone1' to extension 'phone2'. Pick up both ends of the call.. Now on phone1 press the # key. You should hear a voice saying 'Transfer'. Dial the number you have in your parking.conf file that parkext =>points to. In my configuration that would be 701. If you don't dial the extension quickly enough the voice will say that it didn't recognize the extension number. If you dialed the extension number quickly enough then the voice will come back and give you an extension number, in the range specified in parkpos=> . Go back to phone2, if everything is working you should be hearing some music*, or a voice talking. Since we've only set up 2 phones, go back to phone1 and dial the extension that you were given when you parked the call. Once you dial that extension you should be connected back to phone 2. If you dial the wrong extension, the voice will tell you there is no parked call at that extension an hang up. In all honesty unless you have multiple parked calls, it's more than likely going to be the first extension specified in your parkpos=> range. * we haven't added any music to the system, so unless you have done so yourself you'll get the default music on hold file, a mildly comical sentence. Meetme is even easier to set up, there's very little to do here. There are however some potential pitfalls, everything tells us that a Zaptel card is required to use the Meetme functions, I have such a card so I cannot confirm that the use of ztdummy will be enough (remember we modified the Makefile at the top of this document to use ztdummy - effectively faking the presence of a Zaptel card) - I would however be interested in results from people who have tried only using ztdummy.. The Meetme function of Asterisk is like a conference call, multiple users can call in and either listed to a conference (one way) or actively take part (two way). One was conferencing can be useful if you don't want other participants to be heard, perhaps when someone is giving a presentation. Now from phone1 dial, 5557. You should be told that you are the only one in the conference. Go to phone2 and also dial 5557. On phone1 you should hear a tone, signifying that someone has entered the room, phone1 and phone 2 should now be in a conference. If you hang up phone1 phone 2 will hear an exit tone signifying that someone has left the conference. Now call the conference number from both phones, note that the first phone gets no announcement that they are the only caller in the conference, and when the second phone enters no tone is played. Well of course you know you do. Asterisk comes with a large number of configuration files, enough to daunt all but the most experienced. This next section will deal in detail with the main configurations that you’ll need to know about.